Scientists are one step closer to building a carbon-recycling system that can harvest solar energy to efficiently convert CO2 and water into liquid fuels. By optimizing many parts of the system, the researchers say, they can now drive two-electron chemical reactions, a substantial advance over one-electron reactions, which are energy inefficient. The research, reported in the journal Nature Chemistry, will aid those hoping to find a way to convert excess carbon dioxide in the atmosphere into useful energy sources, said University of Illinois chemistry professor Prashant Jain, who led the new research. “Scientists often look to plants for insight into methods for turning sunlight, carbon dioxide and water into fuels,” he said. When solar energy hits plant leaves, it excites the electrons in chlorophyll. Those excited electrons ultimately drive the chemistry that transforms carbon dioxide and water into glucose. “Many of these chemical reactions are multiproton, multielectron reactions,” Jain said. But instead of relying on biodegradable plant pigments to convert light energy into chemical energy, scientists are turning to something better: electron-rich metal catalysts like gold, which at specific light intensities and wavelengths can transfer photoexcited electrons and protons to reactants without being degraded or used up. When coated with a polymer and suspended in water, for example, the nanoparticles absorb green light and reflect a deep red color. 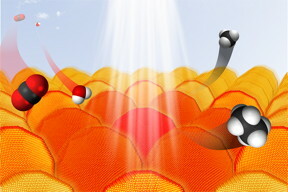 Under light excitation, the nanoparticles transfer electrons to probe molecules, which then change color. This allows scientists to measure how efficiently the electron-transfer reactions are taking place. By varying the intensity of laser light used in the experiments, Jain and his colleagues discovered that at four to five times the intensity of solar energy, the gold nanoparticles in the system could transfer up to two electrons at a time from ethanol to an electron-hungry probe. Two-electron reactions are far preferable to one-electron reactions, Jain said. Jain also concluded that recent experiments his lab conducted using the same system also entailed multielectron, multiproton transfers. In those experiments, his lab converted CO2 to ethane, a two-carbon compound that is more energy-rich than methane, which contains only one carbon. Jain and his colleagues are hoping to eventually generate propane, which has a three-carbon backbone, and butane, which has four. While the new findings represent an important step forward, much more work must be done before this technology is ready to be employed and scaled up to meet current challenges, Jain said. The Arnold and Mabel Beckman Foundation and the National Science Foundation supported this research.